Apollo came to us from our great friends Brenda Van Camp and Mark Lechowski. We had high hopes of him becoming our second owner-handled champion and this boy did not let us down. Apollo started his show career in the Rally ring and obtained his Rally Novice title at 7-1/2 months of age. We then hit the breed ring and we have been having a blast from the get go. Apollo makes it very easy to show him. He allows me to be in the ring to give him treats as he does everything else himself. The future looks very promising for this awesome boy. Apollo finished his AKC Championship in 5 weekends and finished a week in the 9-12 month puppy class. Apollo finished his AKC Grand Championship in 5-1/2 weekends. He has since finished the Silver Level of the Grand Championship and he is now working on the Gold Level. Look for this handsome boy in a ring near you!! He won his first Best in Specialty Show at Hampton, Virginia over Memorial Day weekend in 2016. A first for both of us and then won Best of Breed at the Supported Entry the following day another first. During that same weekend, he won 4 (back-to-back-to-back-to-back) Owner Handler Best in Shows. Needless to say, Virginia treated us well !!! Apollo received his first Westminster invitation in 2016 having ended the year at #4. We attended Westminster and he received an Award of Merit !! 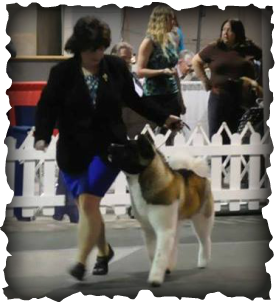 He also received his 3rd invitation to the National Owner Handled Series finals in Florida as he was the #1 Akita. Apollo received his second invitation to Westminster having ended the year at #5 as well as his 4th invitation to the National Handled Series finals in Florida as being the #2 Akita. Apollo received the Select Dog award while at Westminster in 2018.